Actually, such tender situation was happened suddenly at the age of 6; after she got the high fever. She was taken to the different hospital but it wasn\'t cured. And finally, it made her disabled. In the starting days of her disability, she could just crawl from one place to another. That time she didn\'t know about any equipment which she could use to make herself comfortable. Once, she came to know about our project, she came here with lots of hope. <?xml:namespace prefix = v ns = \"urn:schemas-microsoft-com:vml\" /><?xml:namespace prefix = w ns = \"urn:schemas-microsoft-com:office:word\" />After her every IQ test and other exams, she was chosen for the special project. For that, she was given trainings of uses of wheel chair, three months embroidery course. She has done well in the period of training. So, the project gave her an opportunity of working as well. She has completed her working opportunity with the special project. During the time, she builds up the confident level more. Now, she says,\" I have thought to work in the field of embroidery. I am just searching the place. I am in the process. 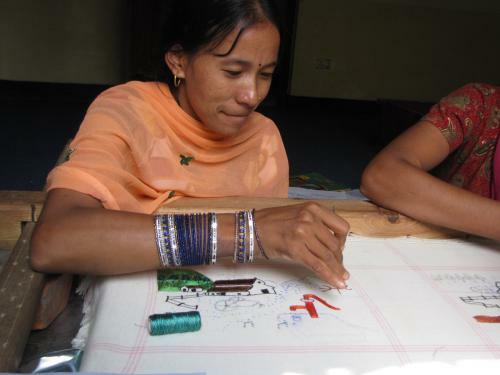 \"She likes owner herself one \'Embroidery workshop\' in the district headquarters of Ramechhap. Whatever she has gained from the period of 1 year, she likes fulfilling it doing practically. She is happy with her decision. And finally she ends saying,\" I haven\'t dreamt that I could make some desire to be fulfilled. It is all possible due to the support and help of TSDCBD\".